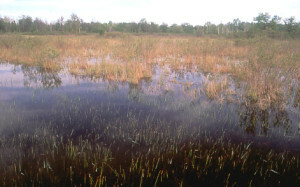 Alvar (alvar grassland) is a grass- and sedge-dominated community, with scattered shrubs and sometimes trees. Alvar occurs on broad, flat expanses of calcareous limestone or dolomite (dolostone) bedrock covered by a thin veneer of mineral soil, often less than 25 cm deep. Alvars are only known from three areas of the world: the Basaltic region of northern Europe, County Clare of northwest Ireland, and the Great Lakes region south of the Canadian shield. While the MNFI site shows the range of this type of community located in norther Michigan, small relics of this type of system have been found in Monroe County Michigan and Lucas County Ohio.